I’ve got a new twist on my normal organizing posts this week. I know not all of you are bloggers, but keep reading! This method would be great to track family schedules as well. 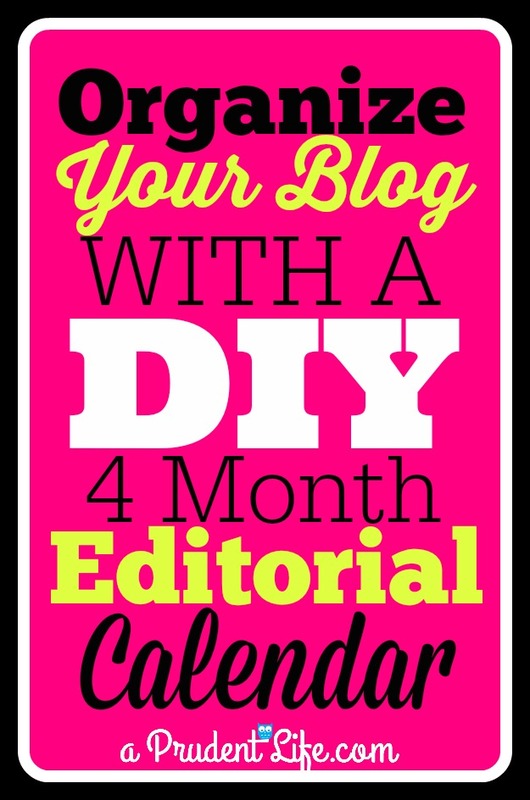 I love my Google calendar for so many things, but I was really struggling to visualize multiple months of blog posts. 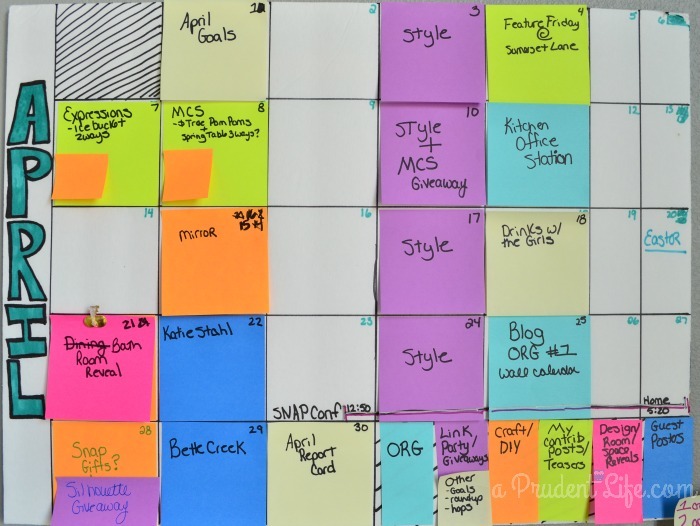 I knew I needed to plan ahead for future months, but as I planned, I desperately wanted to be able to move things around AND have everything color coded. I thought about doing a huge chalkboard or whiteboard, but you would have to erase everything and rewrite it each month. I wanted to easily rotate so I would always have the current month, plus three future month on the wall. I figured out the perfect solution! It isn’t my most beautiful creation to look it, but functionally it makes me SO happy! 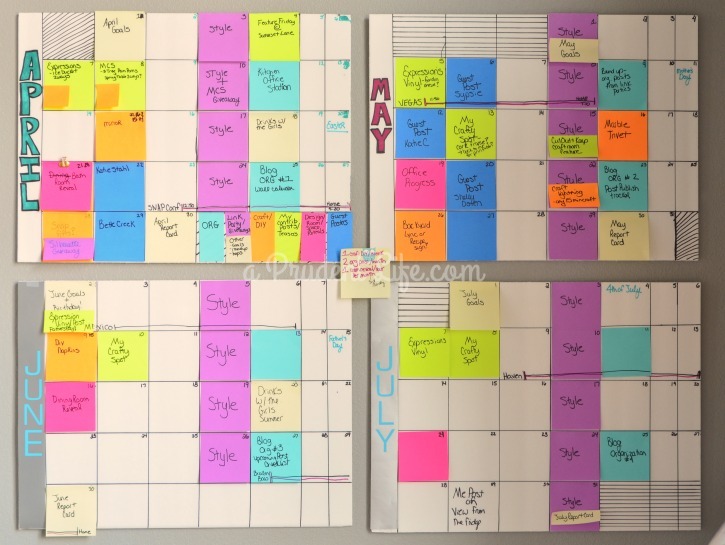 Foam board + Command Strips + Post-it notes= rotating calendar awesomeness! My plan was simple and cheap, so I was elated when it worked. I got foam board from the Dollar Tree, cut it in half, and made each 1/2 of foam core into a month. That means I got TWO months for $1. Yippee!!! Because I was so darn lucky, 1/2 piece of foam core is exactly the height of 5 rows of 3×3 post it notes. There is just enough room to do 6 rows of Post-it’s across and have a small area to label the month. I combined Saturday/Sunday, so 6 squares across was perfect for me. 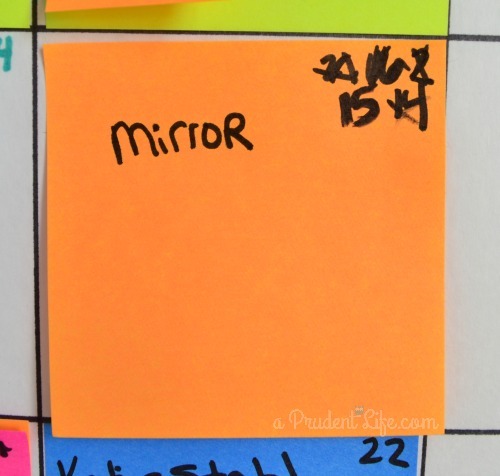 You don’t even have to measure – I used a Post-it and straight edge and had a month drawn out in about 2 minutes. I decided to start each row with Monday instead of Sunday since I generally only post during the week. I added the date to the upper right corner and crossed through squares that don’t exist (like the first square on the April board since April 1st was a Tuessday). I used the spare space at the end of the month to make a color coding legend. I wanted to be able to quickly tell where I was lacking in my planning and if I was overdoing a topic. I can’t put into words how much this has helped me plan for the hectic couple months I have ahead of me. It also forced me to sit down and think through my goals for the blog. 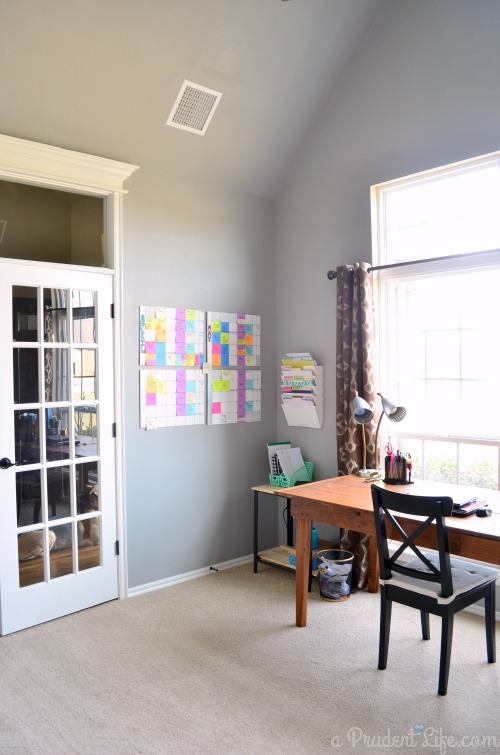 For example, doing at least two organizing and one room reveal post each month. The Post-it notes are awesome because they are mobile when you need to reschedule something. I probably shouldn’t admit this, but I moved the Shim Tack mirror post FIVE times. Having the visual calendar was great though, because each time I moved it, I could see how it impacted everything else. The most exciting thing about all of this is that on May 1st, I can pull April off the wall, move all the other months easily because of the Command Strips (they are like Velcro), and add August. As you can see, I already have May filled up (I aim to post four days a week right now). I even have some set dates all the way in July! When I have some free time, I’ll do more to make the calendar area look good. But for now, it is reducing my stress level just being able to see what is coming up. UPDATE: Now I use a set of gold dry erase calendars for my editorial calendar. See them here! « Party in style … DIY Koozies! I probably told you this already, but I really need to have an organized visual calendar like this. I rely on my google calendar right now, but it’s just not the same when I’ve got other non-blogging events intermingled. The post-its are definitely a good idea. I constantly move things around and switch up dates to post things. Ha! Can’t wait to hear about SNAP! Now THAT’s organization! I need something like this. I keep letting things fall through the cracks! I love this idea! I am working on improving my scheduling, too. I’d say following a schedule is my biggest challenge/weakness. Thank you for sharing! This is one of those never seen but much needed topics. As a new “professional” blogger I’ve struggled with how to organize it all even though I’m pretty good at organizing! Thank you for sharing this and your After Publishing Tracker. Very helpful information! Thank you Nancy – I’m so glad the posts were helpful! I agree – even being an organized person it is hard to keep track of everything blog related!